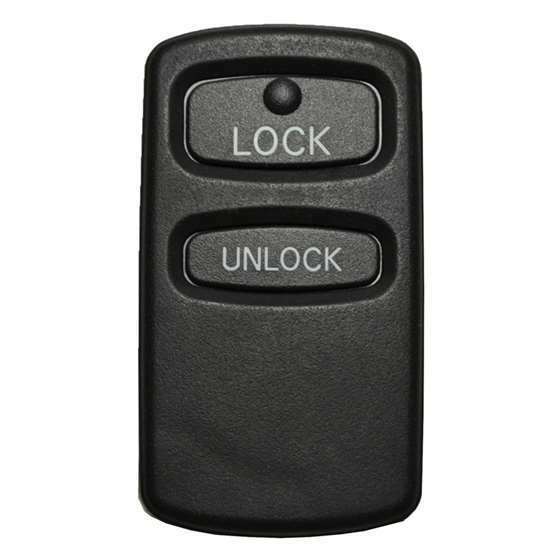 This keyless remote programming instructions work for L,U remote with part # MR587983 FCC id OUCG8D-525M-A and part # G8D-525M-A on the back of it. Follow the steps below to program this remote to the system. 1. 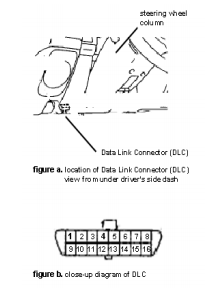 You will need to look for the Data Line Connector (DLC) underneath the driver’s side dashboard. DLC is typically located either to the left or the right of the steering column base. Use the figure to the side as a map for your DLC (they usually are not numbered). View in figure b, is looking straight into the cavities of the DLC. Notice how the DLC is tapered on both ends: we will be working on the wider row of cavities (1 through 8 in figure b.). 3. Check if there are metal contact pins in terminals 1 and 4 first then connect the terminal 1 and terminal 4 using a jumper wire (leave the jumper wire connected until step 7). NOTE: Make sure you know which terminals are 1 and 4. 4. Within 10 seconds after connecting the jumper wire, press the Hazard Switch 6 times. The doors will automatically lock and unlock once indicating that the system is in the programming mode. 5. Press either the LOCK or UNLOCK button on the transmitter to be registered three times within 10 seconds. Upon successful programming, the door will lock and unlock once. 6. To program another remote just press Lock or Unlock button 3 times within 1 minute.Door locks will cycle once it's been programmed. 7. Remove the jumper wire from the terminals and the key from the ignition to exit from programming mode.